This article is 3307 days old. St. Clair College’s newest facility and the future home of the Journalism program is nearing its opening day. The ‘Media Plex’, an example of adaptive reuse in Windsor’s core, has been a million dollar project to convert the old Salvation Army building at University and Victoria streets into a state of the art journalism facility. Work crews spent Wednesday morning installing large silver block letters on the south side of the facility. 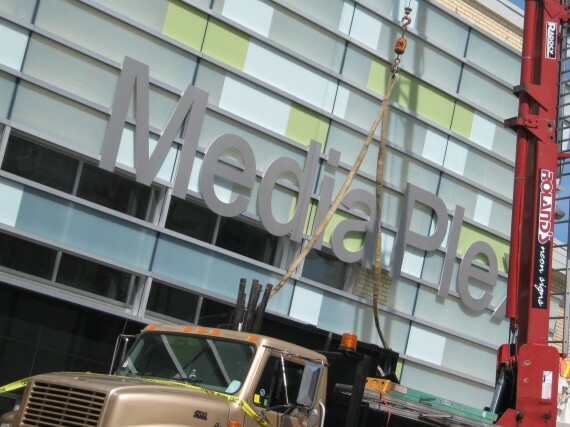 The Media Plex is scheduled to be open to public and student tours on Wednesday April 14th starting at 5:30pm.